This month I wanted to make something fancy-pants, something a bit more formal to wear for a special occasion, but this is me, so it pretty much had to involve a fun print. 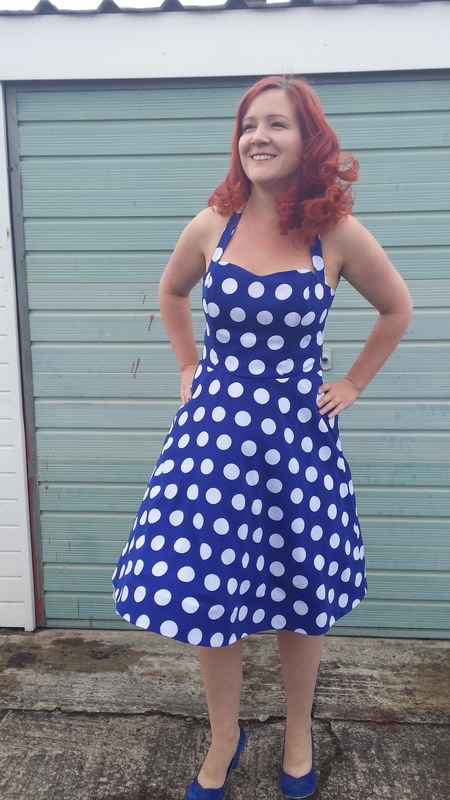 I have some hen parties and weddings on the horizon, and although I have an epic selection of RTW party dresses from back in the day when I had more money and didn’t sew, I’ve already worn all of those and I want to be sporting me-made pretties. It feels weird to me now to wear an entirely shop-bought outfit (and I feel guilty about it too!). 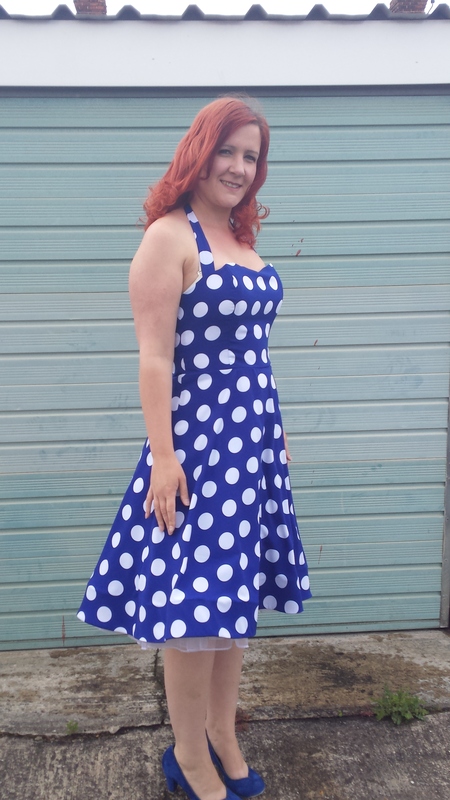 I have a Vivien of Holloway red polka dot halter-neck dress that I have worn on several occasions (including a dear friend’s wedding) and I truly love it. One evening, whilst browsing through Minerva’s impressive collection of fabrics (seriously, thousands of fabrics – choosing takes me hours! 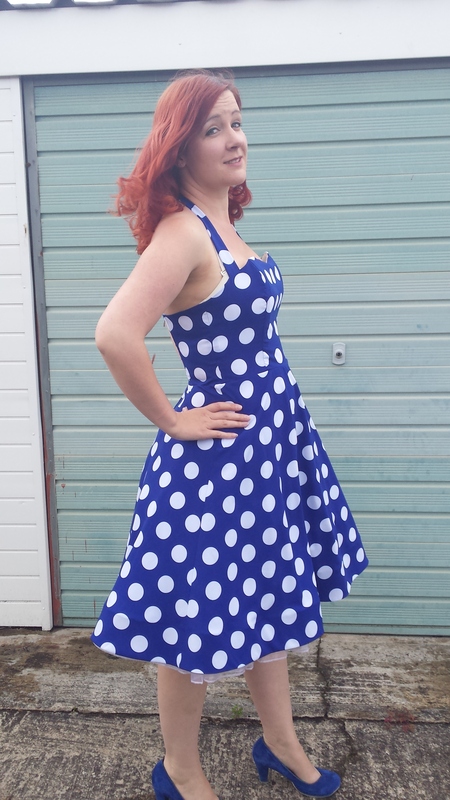 ), I came across some royal blue dressmaking fabric with large white polka dots, and the idea of replicating the Vivien of Holloway dress was born. I don’t think they actually stock this fabric any more, I think I may have got the last of it! I would now need a halter-neck, full-skirted, fifties-style dress pattern: enter Simplicity ‘Amazing Fit’ 1606. I was thrilled to find this because I really like the Amazing Fit patterns and the way you can customise the fit without too much of a headache. I’m getting better at fitting all the time, thanks to my pattern drafting course, but if there’s an easier route, I sure as hell don’t mind taking it! 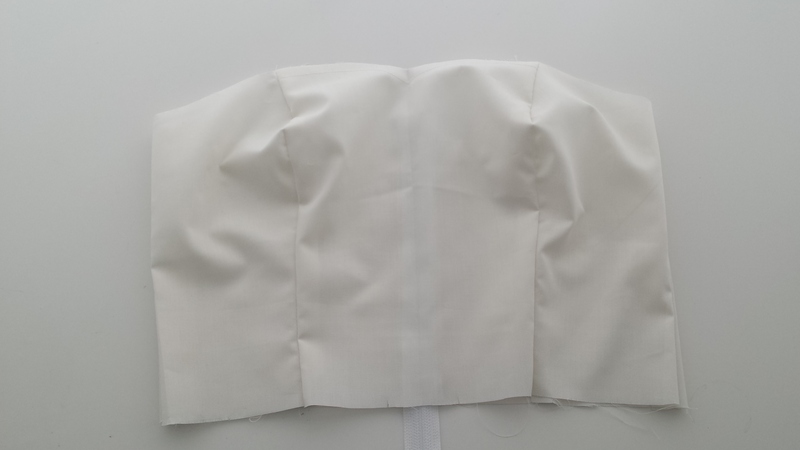 I made a toile a size smaller than usual and a cup size smaller too, and found I needed to let it out a bit at the waist, so I tapered the side seams from the 1″ included down to 5/8″ at the waist and that was enough to get a good fit. I used Rigilene boning for four of the bodice seams as instructed. I’ve used this a lot on my pattern cutting course with various toiles of corsets etc so it was nothing new to me and it is so easy to handle. 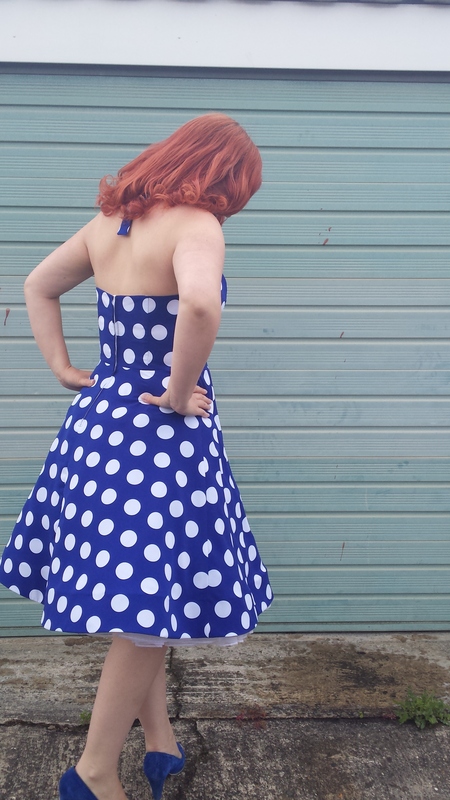 It only provides light support, especially as with this dress it’s only used on the side front and side back seams, but I planned on wearing a halter-neck bra under this dress so it was just enough to give a bit of extra definition and a nice shape. You can see on the photo below how it still curves towards my body even if I’m leaning back! I used horsehair braid for the skirt hem. 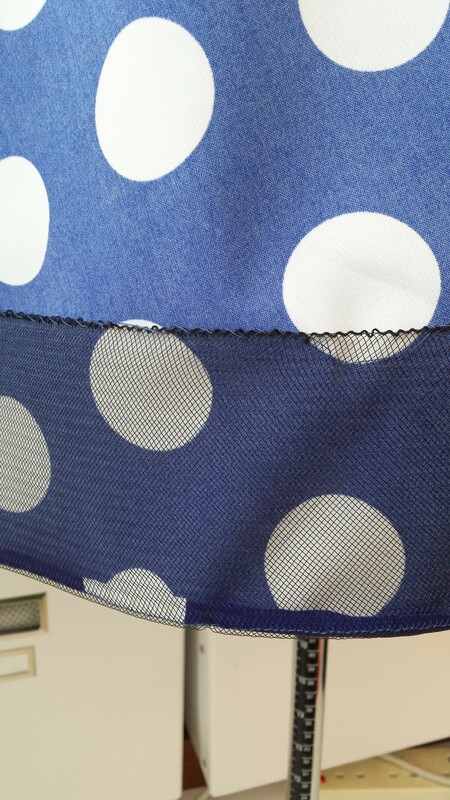 I machined it to the bottom edge of the hem and turned this in, and then hand-stitched the top of the braid into place so that no stitching can be seen from the outside of the dress. Surprisingly, I didn’t need to gather it up that much at the top (perhaps because this dress is not a full circle skirt). I so very, very rarely hand-stitch a hem, but a machined hem would have looked ridiculous with the horsehair braid, especially with it being so deep. Ideally I would have used white braid, but black is what I had so black is what I used! I did a centred zip at the back but I really wish I’d done a lapped zip instead or my usual concealed zip. It doesn’t look that great, but having said that it doesn’t look so bad that I could be bothered to unpick it! I usually strive for perfection, but this time I guess I was in too much of a hurry to finish the dress. The fabric is, if memory serves, a polyester rather than a cotton, and it has a beautiful drape and is nice and soft, much nicer than my Vivien of Holloway dress which seems to be made out a quilting cotton. In the photos I’m also wearing a fifties-style tulle petticoat for extra fouff! I would also like to either make a white bow belt using Tilly’s tutorial, or get one of those white vintage-style wide elasticated belts with the metal clasps at the front. Then a nice white hat or fascinator, a little clutch bag, and I’m ready for a wedding! 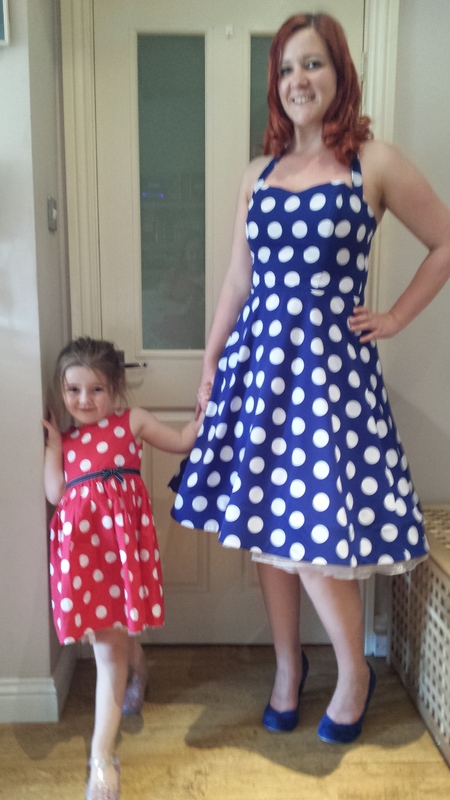 Me with Little Tweedie in her red polka dot dress! Thanks once again to Minerva for enabling my dress dreams to come true! Oh I am in love with this dress. Polka dots are my favourite. And it fits you like a dream! Thanks. Yes, I’d better not lose weight now or put it on! I love this. I want to make it! This is absolutely gorgeous. Perfect! Thanks Lucie. I am pleased with it! Stunning frock! That royal blue is a terrific colour for you! Thanks. The colour is good, very vibrant! 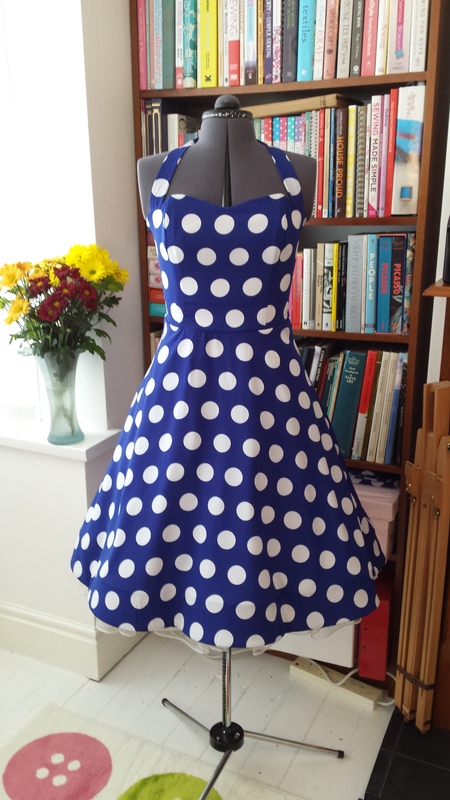 Love the polka dots! Everyone in my household is crazy over dots! I love that dress, I have never used boning before (yeah, I have some in my stash). I understand the need for it in this dress. Looks perfect, and I love the hint of the petticoat at the hemline. The petticoat is definitely the finishing touch! Thanks. Looking forward to wearing it! This is gorgeous! Absolutely stunning, and such a good fit! I love the polka dots as well 🙂 what was the pattern drafting course you did? At my local adult education centre. I enrol most terms but I’m taking the summer term off this time! 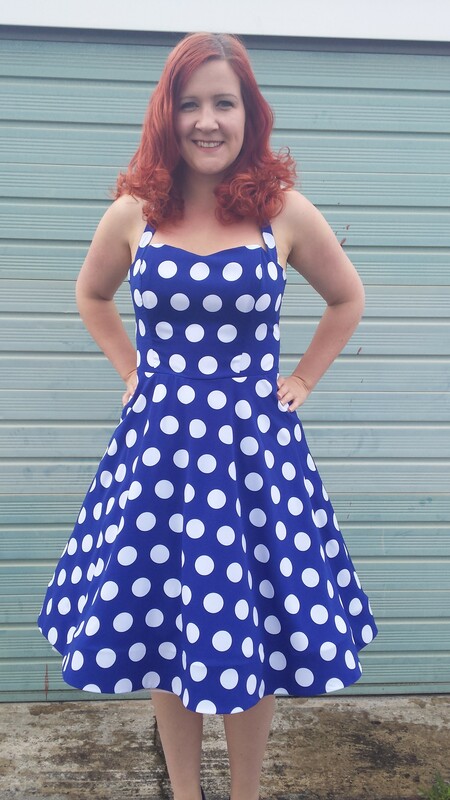 Fabulous polka dots! It looks amazing on you. Love the horsehair hem. That’s a celebration dress! Total dress envy going on here. It’s perfect, and you look stunning! It is a good shape, love the fullness of the skirt! Beautiful! The bodice has such a nice shape. You look amazing! Thank you Liza Jane. Think I will wear this to my sister-in-law’s wedding! This is sooo cute and it fits you so well. Great colour on you. Thank you. I am so pleased with it. This is gorgeous! It’s so glam! Glam enough for a wedding, I think! Thanks Lynne! Awe, I love the pic of you and your daughter in matching dresses! Your dress looks beautiful & looks great on you! Ah yes! The matchy-matchy mother-daughter photo just had to be done! Aaaw thanks Sabs. I do feel good in it, but perhaps not quite as good as a pin-up lady! Love it! The fit is great and it’s definitely fancy enough for a party. Definitely. I’ve decided to save it for my sister-in-law’s wedding!